Earlier in the summer I decided to hire a sprint coach and get back to the type of workouts I did in high school and college as a varsity sprinter. I have spent years trying to improve my distance running and my pathetic 12 min/mile was just not improving, so I opted to go back to the style of workouts I prefer; fast and short on the track, heavy and few reps in the weight room. To see how my training was going I signed up to run in the New Balance Classic at the Foothills Athletic Park track in Calgary. It’s called #3 because it was the third in a series of meets in May/June sponsored by New Balance. I signed up for the 100 metre dash (my bread and butter) and added the 400m dash as a workout run. I was always a TERRIBLE 400m runner. The second I stepped on the track I got extremely nervous. Everyone here was super fit and focused and I felt so out of place. It’s a strange feeling to go from being super confident to super intimidated. It didn’t help when they announced people who were Olympic athletes or National champions and here it had been 11 years since my last sanctioned race. My spikes were 14 years old. Queue the butterflies!! 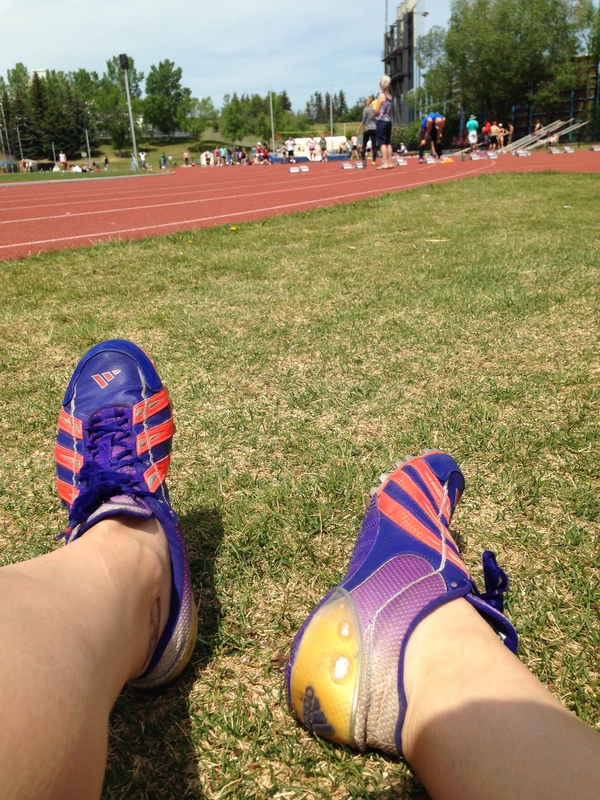 Haven’t worn these spikes since 2004!! I don’t know if I’m remembering the timing of track meets incorrectly or if it’s different in Canada or it was just this meet, but they didn’t run the 100 metre dash right after the hurdles. When I saw the hurdles up, I got warmed up, spiked up and headed over to the start only to be told the 100 m dash wouldn’t be for another hour and a half. The 400 meter was before the 100 and since I always sucked at that race and I was already so nervous I felt sick, I opted to scratch out in case it killed my confidence even more or caused an injury. Super glad I scratched out of the 400m! Finally the 100m came and I found myself in a heat with a mix of high school and college athletes. I put in a slow seed time of 13.7 and my goal for the day was a 13.5- the time of a JV high school athlete. I figured that was realistic for my fitness level. The gun went off and everyone else in the heat pulled ahead of me right away. I picked up speed at the 50 m mark and was able to pass the girl in the lane next to me before the finish. It all went by so fast I don’t remember anything about it. When I saw my time my heart dropped. This is even embarrassing to put online…. I ran a 14.4. A 14.4!! That is what middle school (Grades 6-8) children run. I didn’t even run a slow high school time. To say I was upset was an understatement. I got my things, went to my car, and cried. I know I’m not a competitive athlete or anything, but I’m competitive with myself and I have sacrificed a lot to maintain my regular workouts and that slow of a time felt like a complete failure. After my pity party, I told myself that I was in this because I enjoyed it- not to go to the Olympics and I ashamedly told my coach about the event. He was super supportive and said after 11 years, getting into the blocks and trying to run a 100m is daunting and it was all going to take time to shake off the rust. I’ll continue my workouts because I love them but I have never felt older or more out of shape than I do now. I could call it quits and make life a lot easier but I’m going to stick with it and find another meeting July and see what my time is life there.